As an industry matures, does it become less complex and move into the complicated domain on the Cynefin framework? Catherine Walker asked this question in a recent post and these are reflections. As a whole, the industry itself does not move from the complex domain to the complicated domain. It is closer to the images above. When it starts, there are a lot of unknowns. As we learn more about the system, some practices become stable, but require expertise. Some practices even become well-known and move into the simple domain. Over time, there are more practices that are stable, more predictability and the industry can be well understood by experts. There are also more best practices. However, there is a danger in the simple domain (and probably also in the complicated domain) that something will tip the system into chaos – like when our Ferris wheel cracked in Melbourne. With most industries, we will continue to push the boundaries and this is what will keep them active in the complex domain. 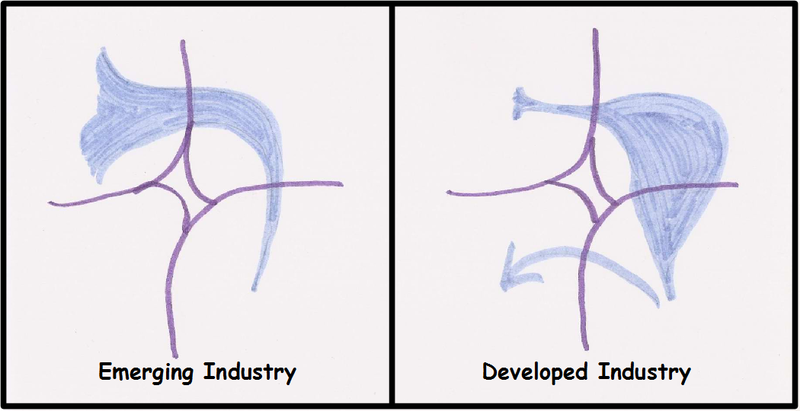 It is likely that industries ‘pulse’ between the two diagrams, moving back towards the emergent picture when we learn that we did not really understand as much as we thought we did. An example is positive psychology of recent times. This entry was posted in Cynefin by kb2bkb. Bookmark the permalink.